These days, fasting retreat programs and diets that promise a fast way to lose weight are gaining increasing popularity as they propose a convenient solution to weight loss. There are many ways to lose weight the healthy way and starving yourself is not among them. Experts strongly advice against following weight loss programs that advocate fasting or restricting dieting. You can lose weight. Whether or not you will reach your target goal depends on the intensity and the duration of your fasting diet. 1. The weight loss due to a starvation diet will be mostly due to the loss of water not due to abdominal fat loss. Prolonged fasting for a week can cause dehydration and electrolytic imbalances, which can lead to side effects such as headaches and dizziness. 2. 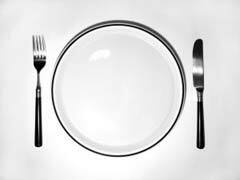 Fasting diets lead to slower metabolism, which leads to slower calorie burning and fat storage. 3. There will be loss of muscle due to the inadequate supply of protein, which can lead to muscle weakness. 4. Malnutrition can be a result of starting yourself for a week. Starving diets provide inadequate nutrition, which leads to malnutrition. You can experience unpleasant side effects such as fatigue, irritability, extreme hunger and food cravings. 5. You may not be able to stop binge eating after you end the fasting diet. This can lead to weight gain and its high likely that the weight gain will be due to fat deposition (because of slower metabolism). 6. Many people use appetite suppressant that help reduce hunger. Although the drugs can suppress appetite, they can produce unpleasant side effects. Many suppressants are linked to health conditions such as high blood pressure. They can also act as nervous system stimulants and cause addiction. 7. You may develop sleeping problem, which is a common side effect of starvation diets. Lack of sleep can cause hormonal imbalances and stomach fat gain. If you are considering a starvation diet, you should consider doing it under medical supervision.